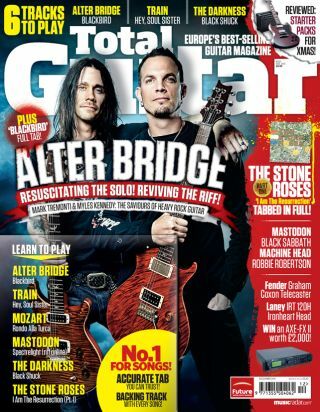 Total Guitar issue 221 is now on sale and it's Alter Bridge's first ever TG cover, featuring a full tab and backing track for 'Blackbird', plus a massive Mark Tremonti and Myles Kennedy interview. This month we look at the Fender Graham Coxon Telecaster, Yamaha RGX420DZII, Group Test: Electric starter packs, Laney Ironheart IRT120H, TC Electronic Röttweiler Distortion, Head To Head: Peavey HP Singlecut SC-2 vs Cort CR250, Italia Maranello '61, Native Instruments Guitar Rig Pro 5, IronGear Volt Pickups, Electro-Harmonix Ravish Sitar. Plus! Accessories and Ed's Shed. Win a Fractal Audio Axe-FX II worth £2000!